Award winning horticulturalist with over 27 years experience, featured on BBC Radio Cornwall’s gardenline and West Briton columnist. Specialist in plant knowledge, garden management and design. I can visit your garden and advice you on any aspects necessary, including pruning, plant information, pest and diseases, low maintenance gardens, tips on monthly garden plans & lawn care. I am able to give talks for gardening clubs or any enthusiastic groups or societies. These can be tailored to your requirements/interests. I can design planting schemes which meet your preferences on the look you require i.e architectural design, cottage gardens, herbaceous planting, low maintenance, floral and many more. 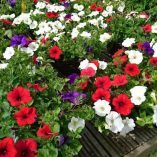 See my sales page for good quality plants posted directly to your door at affordable and competitive prices. I can help you redesign your garden, supply quotes and manage any garden projects including hard and soft landscaping. I have had many years experience in laying turf and will be able to measure, price, supply, prepare the ground and lay your turf. My next Garden Line date is 16/01/2019. 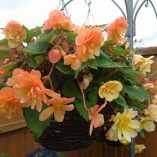 Orders now being taken for your summer hanging baskets, discounts for early and large orders.